Best Odds Guaranteed (BOG) means that if the starting price of your selection ends up higher than the odds you took when you placed your bet the bookmaker will pay you out at the bigger price if your bet wins. This can give you a nice little extra boost to your profits so always consider using these bookmakers for your matched betting. Best Odds Guaranteed on all Daily UK and Irish Racing for all bets placed on the internet from 7am on the day of the race. If the starting price ends up higher than the Early Price you take they will pay you at the bigger price. Please note that Board Prices are not included in this offer. The offer also does not apply to Lucky 15s, 31s and 63s and BOG can be withdrawn from account holders at Betfred’s discretion. Applies only after 7am on Day of the race. Best Odds Guaranteed on all their Daily UK & Irish Racing. If the starting price ends up higher than the odds you take they will pay you at the bigger price. Boylesports reserve the right to remove the BOG offer at their own discretion. Only available for UK & Ireland customers. It most certainly is as the PDC World Darts Championship 2019 gets underway on Thursday at the Ally Pally in London and we can’t wait. And by the looks of it neither can the bookmakers, so there will be money making opportunities a plenty as well as some fantastic darts coming up over the next 3 weeks. Happy Christmas indeed. Here are the pick of the current offers available so far from our leading bookmaker partners and remember all these offers are for existing users too. MANSIONBET 22/12/18 Place a minimum of 5 x £5+ LIVE single bets on PDC World Championship matches in a day. Accept the Free Bet pop-up once qualifying bets have settled. Enjoy your £5 Free Bet daily! BOYLESPORTS 22/12/18 We are paying Double Winnings as a free bet if the winning player wins the match with a check-out of 100 or greater. 18+. UK/IRE customers through all channels. Opt-In. Max Stake £/€50. Max Free Bet £/€500. 1st pre-live single bet. Free/cashed out bets won’t qualify. Free bet expires after 7 days. Why not let us bring all the latest and breaking news to you. Yes subscribe to our RSS feeds to receive instant updates of the latest and greatest offers direct from bet72.com, along with links back to the full versions. So you will never miss another offer. It really is that easy…. Here are some of the feeds in action! In addition to free bet offers and sign up promotions for new customers, many bookmakers now offer money back specials and other betting offers for existing users. However it can often be difficult to track them down across all the sites that are out there so you can have the pick of the very best ones easily to hand. 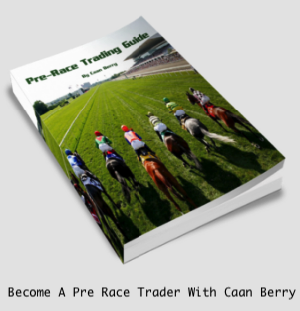 Well fear not, we have done all the hard work for you and hand picked the latest and greatest current and ongoing offers available from our leading bookmaker partners and put them all on one, ever so handy, page. And the best news is there are lots of them, we mean lots and all for existing users too! So now you are never never more than one click away from the even more money making opportunities. Come and take a look…. A brand new bookmaker has hit the bet72 shelves and it is excellent. ACBET is a new bookmaker with a very, very exciting sign up offer (with a little twist), a whopping 50% deal upto a maximum of £150 to be precise. This is a instantly withdrawable cash bonus, that is credited once you have wagered your initial deposit over 3x at odds of 1.8 or above. But here’s the twist, should you lose your entire first deposit (i.e. have to redeposit), you will not receive the bonus. So here is a bookmaker who is actively encouraging you not to lose so you can get a bonus! So you have to have a little think here as this gives you a few options on how to play it. For example. Deposit and wager the full amount in one hit, overlaying on the betting exchange such that if you lose you will make a profit. If you win then repeat and if needs be repeat again until you have either bust or met the 3x wager requirement. As long as you have not overlayed more than the value of the bonus in total then you will make a profit. Deposit the full amount and wager much smaller amounts £30 – £50 a bet i.e. you would have to go on a major losing streak to lose all of them. Until you have wagered the requirement and get your bonus credited. Their odds are very good on actually so you should have no trouble find suitable match ups. In fact this is how we tested it and the over/under markets on football were very good. We did all the wagering around the even money mark oddswise, so there were small liabilities on the exchange too. 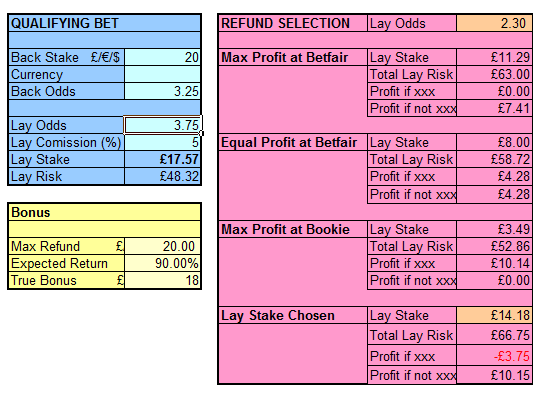 In fact we ended up losing just £25 from the overall wagering giving us a very healthy £125 profit from this offer! And get this, once the wagering was completed, emailed them to ask for the bonus, sent in the required ID via email, this was almost instantly verified and requested a 3 figure withdrawal which hit my MONEYBOOKERS account in under 5 minutes ( well worth using MONEYBOOKERS for this one). In fact the whole support and response process has been a pleasure all the way along so this bookmaker comes with a very big thumbs up here. So if you fancy picking up a very nice bonus from a very nice bookmaker then just click below and get ACBETting! Here are all the T&C’s…. Grab our new sign up bonus: 50% up to £150/€150/$150 on your first deposit of £300/€300/US$300! 1). New Customers will receive a 50% first (1st) deposit bonus of up to £150/€150/$150/ on a maximum first (1st) deposit of £300/€300/US$300 or a $300 equivalent in their country of currency. Should your first (1st) deposit be lost, you will not be qualified to receive the bonus. 2). The promotional offer is valid for new Acbet.com customers depositing from the 27th of October 2011, up until the 31st of December 2011. 3). This offer is limited to a US$100 bonus on a maximum first (1st) deposit of US$200 in their country of currency for new customers of the following countries: Portugal, Czech Republic, Slovenia, Belarus, Hungary, Romania, China, Malaysia, Hong Kong, Taiwan, Korea, Ukraine, Poland, Russia, Georgia, Kazakhstan, Azerbaijan, Romania, Croatia, Armenia, and Uzbekistan. Should your first (1st) deposit be lost, you will not be qualified to receive the bonus. Customers from Greece, Cyprus may not receive the bonus at this time. Please email support@acbet.com to claim your bonus after you have completed the turnover requirements. 4). The deposit must be turned over 3 times on to any type of bets before qualifying to receive the bonus. Customers have 90 days to meet the turnover requirements with settled bets, or else the bonus sum will be forfeited/cancelled. 5). Single and/or/multiple bet coupons with total odds of 1.8 or greater are eligible only. Bets with odds lower than 1.8 will not count towards the turnover requirement. 6). Bets on the same event shall not be calculated for the bonus turnover requirements. Should the customer place two bets on the same event, only the first bet will count towards turning over the bonus. 7). Once the aforementioned conditions will have been met, the bonus will be credited to the customer’s account within 36 to 48 hours, pending all conditions -such as documents when requested and security checks- are fully met. 8). Only one bonus allowed per customer, household, or computer with a shared or similar IP. Players may only beneficiate of one bonus before benefiting of any other sports bonus. 9). Should Acbet.com notice evidence of the bonus amount being misused or abused, Acbet.com will reserve its right to suspend or close the customer account without any right to a refund of incurred winnings, or any other type of financial compensation. 10). Acbet.com reserves the right to amend, change, cancel, reclaim or refuse this promotional offer at its sole and only discretion from time to time. 11). These terms are part of the general terms and conditions of Acbet.com. 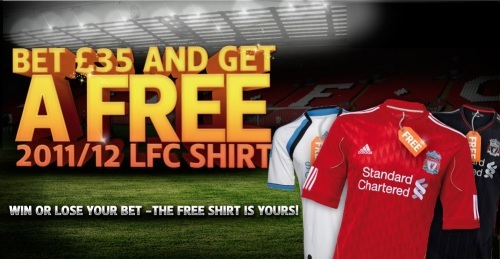 Bookmaker 188BET are getting all shirty once again with a cracking offer for everyone, a brand new free Liverpool or Chelsea shirt. Last month we saw free Everton and Bolton shirts being given away so 188BET have really pulled out all the stops with these two freebies. OK, ok, you may not be a fan of either team, but one word for you here, eBay! A nice brand new shiny shirt should fetch you a few extra quid when sold on there, so well worth a look don’t you think, especially as you can do all this nice and risk free. The great thing is that this offer is open to ALL of their customers old and new. And of course with an offer like this the bookmaker deserves the ODDSMATCHER treatment and we now have 188BET added so finding selections for this is a breeze. If you are already a member then you can dive straight in by visiting either…. www.188promo.com/liverpoolfcshirt, registering for the offer and wagering £35 to grab your free shirt. www.188promo.com/chelseashirt, registering for the offer and wagering £40 to grab your free shirt. Don’t know why you have to wager a fiver less to get a Liverpool shirt but who’s complaining! If not then it is double bubble for you as you can grab a risk free £25 bet whe you join 188BET and then get over to either www.188promo.com/liverpoolfcshirt or www.188promo.com/chelseashirt and collect your free shirt too, brilliant! So to get cracking just click the link below for everything you need or drop us a line (info@bet72.com) with any questions you have…. 1. This promotion is available to new and existing 188BET customers based in the UK. 2. To get your free Liverpool FC 2011-12 Home, Away or Third shirt, place a bet totalling £35.00 in value and complete the form with your email address, postal address, choice of shirt and shirt size. 3. The fulfilment of the free shirt is subject to availability and at the discretion of Liverpool Football Club. In the event that your free shirt is not available in your choice of shirt and size, and representative from 188BET will contact you to arrange an alternative. 4. Every new & existing 188BET customer signing up through www.188promo.com/liverpoolfcshirt who places a £35 bet between Monday 1st August 2011 and Monday 31st October will receive a 2011/12 season Liverpool FC Home, Away or Third football shirt. 5. Shirts will be dispatched to qualifying customers within 21 days of placing their qualifying bet. 6. The football shirts will be sent to the winners directly from Liverpool FC’s retail team. Stocks are limited. 7. No returns, exchanges or refunds will be possible. 8. By entering this promotion, you are agreeing to your name, address, and email address to be shared with Liverpool FC. 9. The Liverpool FC shirt will be a standard short sleeved adult 2011/12 Home, Away or Third shirt with no additional printing, embroidery, badges, etc. Size options available are adult, M, L, XL, XXL, XXXL. 10. After qualifying and claiming under this promotion, customers will not be entitled to enter promotions of a similar nature with 188BET, (e.g. Free £25 bet offer). 11. Only one entrant per IP address will be permitted. 12. If necessary, further instructions will be communicated to the winners by 188BET. 2. 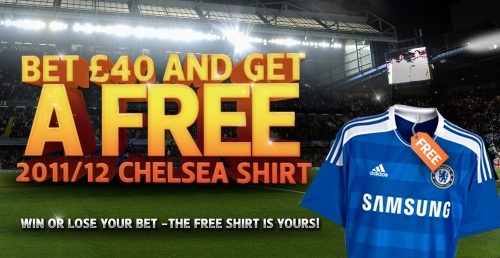 To get your free Chelsea shirt, place a bet totalling in value 40.00 GBP and complete the form with your email address, postal address, and choice shirt size. 3. Every existing188BET customer who places a £40 bet through www.188promo.com/chelseashirt from Monday 1st of August to Monday 31st October 2011 will receive a 2011/12 season Chelsea Home football shirt. 4. The football shirts will be sent to the winners directly from Kitbag, the company that supplies Chelsea Megastore with the shirts. 5. By entering this promotion, you are agreeing to your name, address, and email address to be shared with Chelsea FC. 6. The shirt you will receive will be a standard adult 2011/12 Home shirt with no additional printing, embroidery, badges, etc. Stocks are limited. Size options available are S, M, L, XL, XXL, XXXL. 7. After qualifying and claiming under this promotion, customers will not be entitled to enter promotions of a similar nature with 188BET, (e.g. Free £25 bet offer). 8. Only one entrant per IP address will be permitted. 10. Further instructions will be communicated to the winners by 188BET. I always say you never know where the next big offer is going to come from and once again this has been proven. As the boys and girls over at Bet-At-Home have dropped one of the deals of the year, for everyone to have a go at. A whopping 100% casino bonus upto £80 (or €100) and ALL games count. Yes from now until 30th June deposit upto £80 and get an instant 100% bonus added. The value of the bonus needs to be wagered 40x before it can be withdrawn but like we say ALL games count. So whatever game you always fancy playing but is normally excluded from these sorts of deals, well not anymore. Blackjack, Roulette, Baccarat all count 100% towards the wagering, making this a very positive expected value deal. This is just like the old days of casino bonuses! In fact Bet-At-Home ran the say offer back in December and we had a fantastic response to this with some excellent profits for many bet72ers (some making good 3 figure profits), so we can highly recommend it. In fact I have just tested it all out here at bet72 towers and cashed out £142 for an overal £62 profit playing Blackjack, marvellous! Of course being a casino offer this is not risk free so please understrand that but if you do decide to play then the odds are very much on your side given the low house edge of some of the games available. Take Blackjack for example at less than 0.5% and so if you play with the perfect strategy then you have the very best chance of turning a decent little profit. Also it is dead easy to check where you are upto at any point with the bonus. Just click on the refresh arrows to the right of your Real Money line in the Casino Bank part of the screen and it will tell you exactly where you are at and how much you still need to wager. Excellent. And if you are having a go at the casino you are going to need an account so may as well grab the free sports bet bonus too for so that is a real double bubble of bonuses. Just signup, deposit £45 (or €50) and just enter the code FIRST then you are away to complete the sports free bet offer. All dead easy to do, just remember that the value of the deposit + bonus must be rolled over 4 times at odds of 1.7 or above before you can withdraw unless of course you can bust out along the way! Oh and do email us with your success stories and profits and we will be happy to feature them on the site. * This bonus offer is valid from 16.06.2011 to 30.06.2011 (12:00 GMT+2) and for all bet-at-home.com customers. * As a basis for calculating the bonus amount, the value of the first chip purchase within this period will be used. * The bonus will be automatically activated when purchasing casino chips and the maximum casino chip bonus that can be claimed is 100 EUR. Customers who make a chip purchase of more than 100 EUR may only claim the maximum casino chip amount of 100 EUR. * Customers that stated another currency other than EUR upon registering can receive a maximum casino bonus of one of the following: 80 GBP, 125 USD, 130 CHF, 750 DKK, 400 PLN, 2,500 CZK, 175 YTL, 175 BGN, 4,000 RUB, 400 RON, 1,000 SEK. * The bonus amount must be rolled over forty (40) times and before the 30.06.2011 (12:00 GMT+2). Failing to do so or the selling of a chip amount that is higher and thus stated as an Amount Payable, prior to fulfilling the bonus conditions will result in the bonus amount being automatically cancelled. * Winnings which are achieved with the bonus money can only be converted into real money when the initial bonus amount has fulfilled its conditions. * In order to make a withdrawal from your bet-at-home.com account, the customer must rollover their bonus amount forty (40) times. Information about the current account balance and the necessary amount of the bonus that still needs to be wagered, can be found via mouse over and can be refreshed any time by clicking on the casino bank refresh button (). * This bonus is valid exclusively for you and for the bet-at-home.com Casino. Live Casino, Games, Poker and sports betting are excluded from this bonus offer. * The bonus is limited to one betting account per person, family, household and shared computer. By suspicion of abuse via multiple registrations (fictitious accounts, game communities), as well as, balance betting, bet-at-home.com reserves the right to withdraw the bonus and the resulting profits. * It is not possible to purchase casino chips with sport bonus money. * By redeeming the bonus the player agrees to the bonus terms and conditions as well as the general terms and conditions of bet-at-home.com which can be found on www.bet-at-home.com. * bet-at-home.com reserves the right to amend, cancel, reclaim or refuse this offer at its own discretion. * Customers from the USA, France, Israel, Belarus, Ukraine or Turkey cannot participate in this offer.